The Church of the Nativity is one of the oldest churches in Christendom. Today through the skill of the Italians beautiful mosaics covered for centuries are being brought to light. What a treasure that has been hidden from our eyes! This entry was posted in Christianity and tagged Angel, Bethlehem, Jesus, Mosaic on May 31, 2016 by frjfkauffmann. 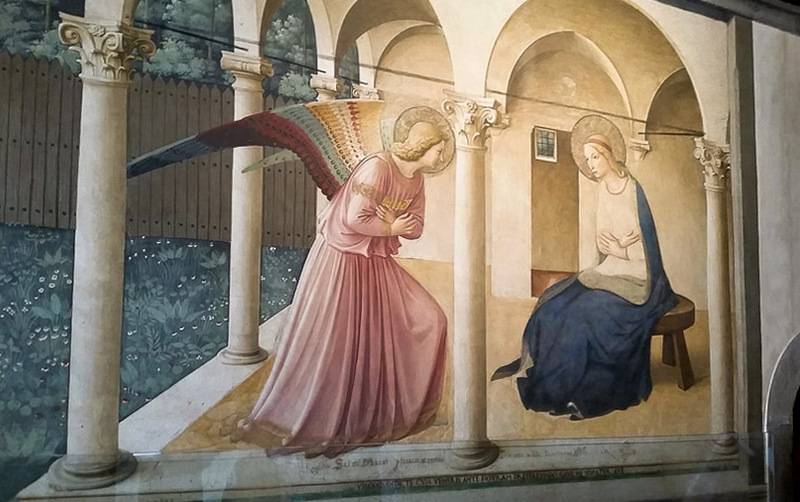 The Annunciation, fresco by Fra Angelico in San Marco in Venice. On the Solemnity of the Annunciation, take a few minutes to pray the Angelus. Ave Maria, gratia plena, Dominus tecum. Benedicta tu in mulieribus, et benedictus fructus ventris tui, Iesus. Sancta Maria, Mater Dei, ora pro nobis peccatoribus, nunc, et in hora mortis nostrae. Amen. Hail Mary, full of grace, the Lord is with thee. Blessed art thou amongst women and blessed is the fruit of thy womb, Jesus. Holy Mary, Mother of God, pray for us sinners, now, and in the hour of our death. Amen. Ave Maria, gratia plena,……. Hail Mary, full of grace, …..
R. Ut digni efficiamur promissionibus Christi. V. Pray for us, O Holy Mother of God. Gratiam tuam, quaesumus, Domine, mentibus nostris infunde; ut qui, Angelo nuntiante, Christi Filii tui incarnationem cognovimus, per passionem eius et crucem, ad resurrectionis gloriam perducamur. Per eundem Christum Dominum nostrum. Pour forth, we beseech Thee, O Lord, Thy grace into our hearts, that we, to whom the incarnation of Christ, Thy Son, was made known by the message of an angel, may by His passion and cross be brought to the glory of His resurrection, through the same Christ our Lord. R. Quia surrexit Dominus vere, alleluia. V. Rejoice and be glad, O Virgin Mary, alleluia. Deus qui per resurrectionem Filii tui, Domini nostri Iesu Christi, mundum laetificare dignatus es: praesta, quaesumus, ut per eius Genetricem Virginem Mariam, perpetuae capiamus gaudia vitae. Per eundem Christum Dominum nostrum. O God, who by the Resurrection of Thy Son, our Lord Jesus Christ, granted joy to the whole world: grant we beg Thee, that through the intercession of the Virgin Mary, His Mother, we may lay hold of the joys of eternal life. Through the same Christ our Lord. This entry was posted in Beauty, Christianity, Feasts and tagged Angel, Angelus, Annunciation, Mary on April 4, 2016 by frjfkauffmann.